Have you ever had halloumi? Actually, let me step back a little further. Have you ever even heard of halloumi? If not you should get in your car right now, head to the nearest Whole Foods or European ethnic market and purchase some ASAP. You are missing out on life. And taste. And all things fried. I mean, you can’t deny yourself such a pleasure, right? That would just be cruel. Halloumi is a Middle Eastern / Mediterranean cheese that pan-fries beautifully. It comes in about 6 oz. packages and has a somewhat rubbery consistency. This is not a cheese to eat straight out of the fridge. It must be melted, grilled or pan-fried to bring out its wondrous qualities. It crisps up like a fried egg with lovely little brown blistery spots all over it. While the outside becomes crunchy and almost caramelized in texture, the inside warms and melts into a yummy, toothsome delight. Like I said. Go. Get. Some. Now. 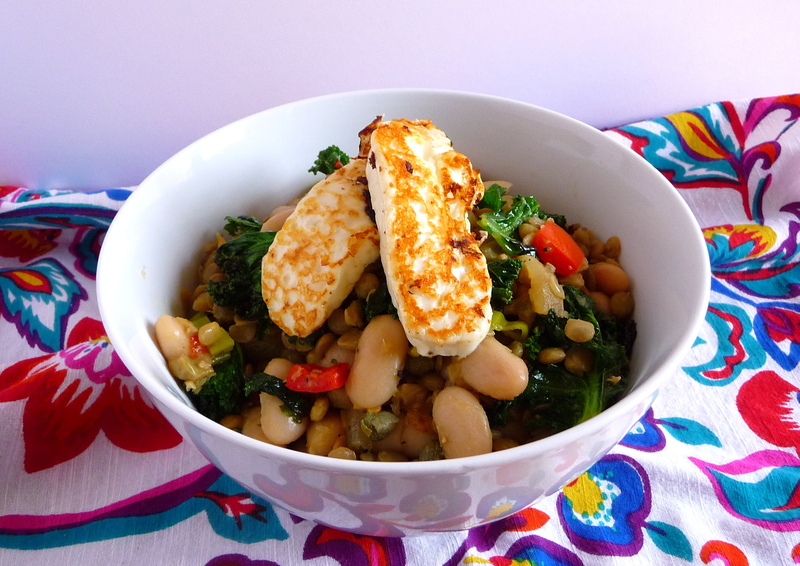 I topped some pan-fried halloumi on a lovely lentil, white bean and caper salad. Very simple to make and ridiculously healthy, this is a great dish to make for dinner parties or for lunch at home. You can make every component (or the whole salad) in advance and chill or leave at room temperature, then fry the halloumi to top the salad right at serving. I love a good do-ahead recipe. First, prepare your green lentils and white cannelini beans. Feel free to do this any way you’re used to, or even purchase them pre-cooked if you’re in a rush. Keep warm or leave at room temperature, whatever you prefer. Dice the onion and bell pepper and saute in a large pan over medium heat with the tablespoon of olive oil until mostly translucent. Add the kale (chopped into bite-sized pieces) and continue cooking until kale is fully wilted while still being green and vibrant. Once cooked, spoon mixture into the lentils and beans in a large bowl. To prepare the dressing, combine the oil, lemon juice, capers (including a dash of their brine) and apple cider vinegar in a small bowl. Whisk until combined and season with salt and pepper to taste. Feel free to smash up some of the capers in the process. They burst with flavor when crushed. Dress your lentil, bean, vegetable salad with the dressing and set aside while you fry the halloumi. This will give the dressing enough time to really flavor your salad. After dressing, adjust seasoning as you see fit. If you’d prefer to not add more salt, more of the caper brine is a delicious way to brighten the dish. Halloumi is lovely because it only takes one step to prepare: fry. Open your package and slice pieces of cheese that are about 3 inches long, enough for 2-3 bites-full per piece. Two to three pieces of halloumi are a good serving size for each person. Bring a small frying pan to medium heat, add a little oil (you don’t need a lot) and drop in the pieces of cheese. Make sure to give them room to fry. After about 30 seconds, peak underneath each piece with your spatula and if the cheese is looking brown and crispy, it’s time to flip. Halloumi burns easily so cooking less is better than more. After about 30 seconds on each side, place the pieces onto your prepared salad. This salad would also be lovely with the addition of some fresh herbs like parsley, oregano or chives. I didn’t happen to have anything fresh on hand today so they are not included in the recipe above. You can easily use another type of bean for this salad if that’s what you have on hand. White navy beans or kidney beans would be lovely. You could also add more soft vegetables to the saute to pack in some more veggies, like zucchini or even eggplant. For the dressing, a balsamic vinaigrette would be nice but make sure you reduce the amount of vinegar, as it would easily overpower the light halloumi. Thank you for using Halloumi. This cheese is coming from my country, Cyprus. You can have it in salads, sandwiches, soups, for breakfast, lunch or dinner. You are right. It is really delicious.